One of the more difficult problems in wrist surgery is an injury to the ulna side of the wrist associated with a distal radius fracture. When should these be treated acutely and when do they resolve without the need for surgical intervention? The long term disability due to DRUJ problems is significant and includes pain, instability, loss of motion or any combination of the above. Injuries can be to the soft tissues, the bone or both. Fracture of the distal ulna frequently occurs with a fracture of the distal radius, most commonly involving the ulna styloid. Less common is instability of the DRUJ associated with this. Predicting which fractures lead to instability can be difficult. 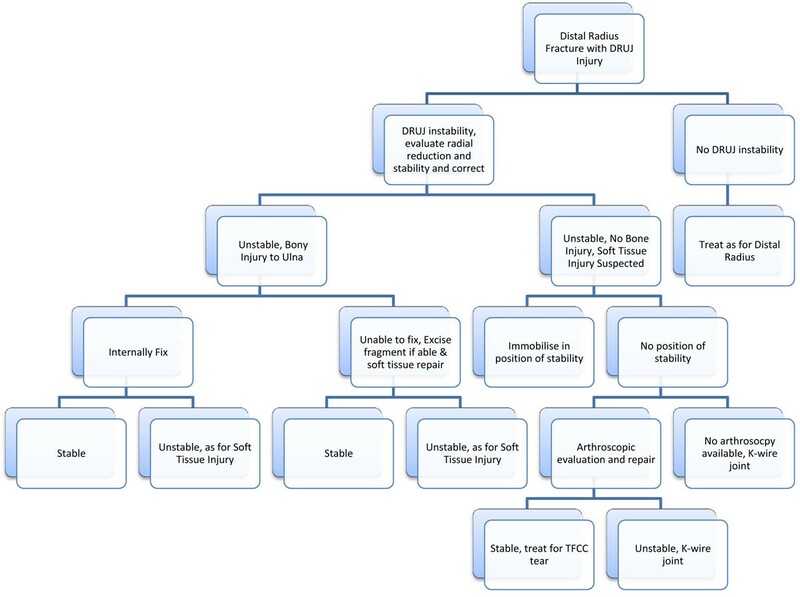 It is impractical to get an MRI on every patient to evaluate the integrity of the TFCC and instability is not necessarily a consequence of a TFCC tear, therefore guidelines can be developed for assessing and treating styloid fractures. 3/ Fracture of the head/neck of the ulna should be treated on the basis of stability and involvement of the articular surface with restoration of joint congruity the main aim. Whether or not to stabilise base of styloid fractures leads to heated debate among many surgeons with proponents of both approaches. Class I are traumatic tears of the triangular fibrocartilage complex according to his classification. Type D are radial tears of the triangular fibrocartilage complex from the radius. If there is no tear to repair and remains unstable then pin the joint with a 2mm K-wire, proximal to the joint. If no arthroscopy is available, pin the DRUJ with a 2mm K-wire just proximal to the joint to minimise articular damage.